By the late afternoon, my stomach was definitely making it known it was time to eat lunch. We’d been waiting for hours as a special meal was carefully prepared. Finally, our beaming hosts brought out the prize dish – a blackened, charred heap. Hey, they do say things are different in Catalonia. 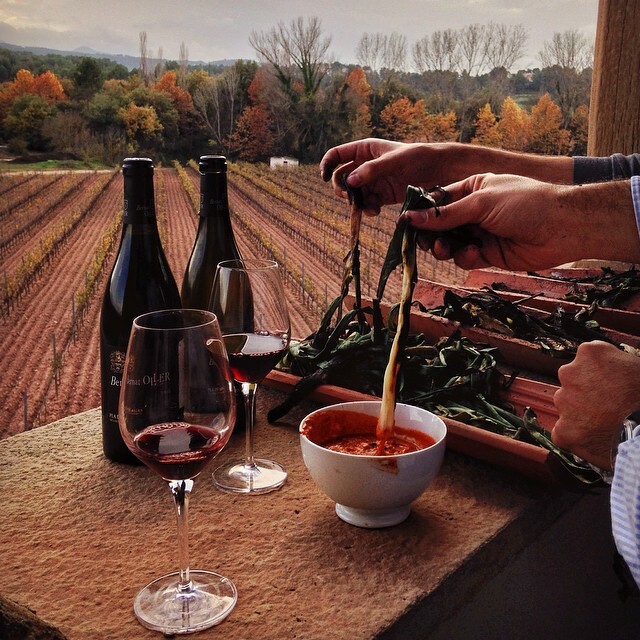 The arrival of late winter and early springtime in Catalonia means one thing – the arrival of singed, stringy onions appearing all over the region. In other countries, if your hosts happily presented you with a burnt pile of food in the center of your table, you might back away nervously. But in Catalonia, the appropriate response is to ooh and ahh…and then tuck in. Welcome to the strange world of the calçotada. You won’t find this tradition in many other places, including the rest of Spain. Calçotadas are a very Catalan tradition, so you’ll only find them in this northeastern pocket of Spain. 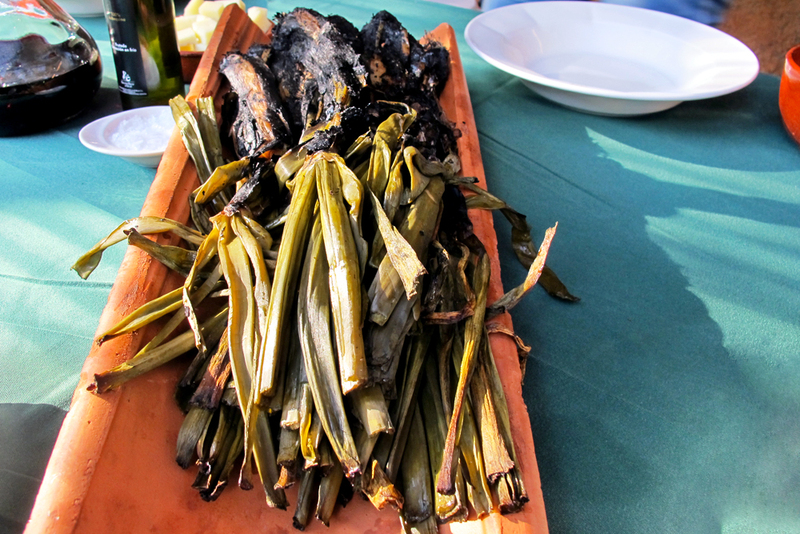 And like many traditions that are very Catalan, the locals take great pride in their calçotadas. Perhaps you’re wondering what the allure is of eating food that’s been burned to a crisp. 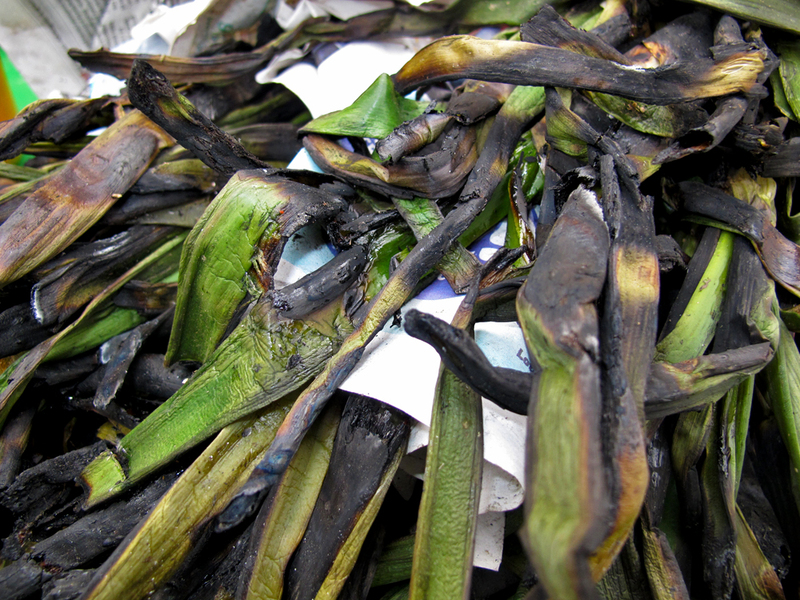 It’s not because Catalans are crazy; they’re just crazy for calçotadas, and for good reason. Despite their rather unappetizing appearance when cooked, calçots are actually delicious. 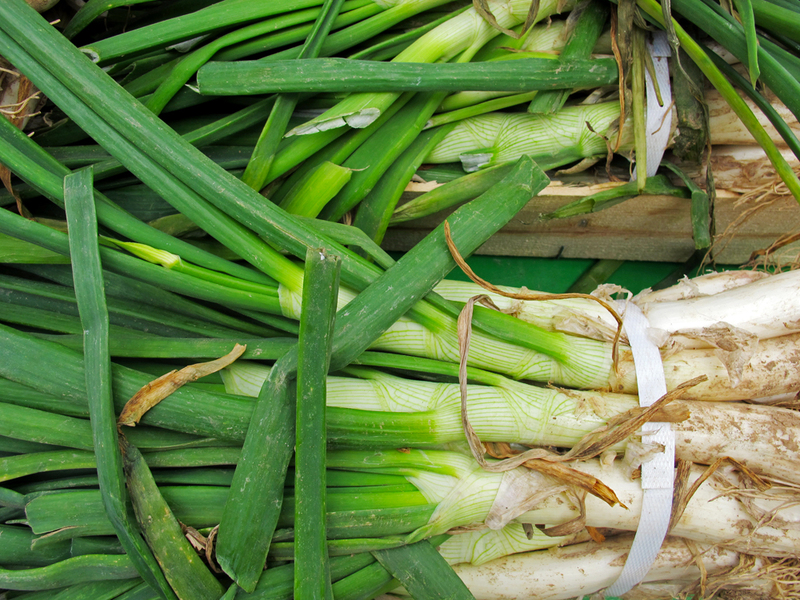 They’re a special type of mild green onion, and they look more like a leek than anything else. Between November and April, there are calçot festivals and barbecues called ‘calçotadas’ held to worship the onion. These funny onions are devoured in the thousands all over Catalonia, with locals comparing how many calçotadas they’ve been to so far this calçot season. (For the record, I have been to two so far this season, making me the calçotada champion at a table of rather pleasantly taken aback Catalans, who were happy that the guiri was getting into the spirit of things). Where can you go to a calçotada? Pretty much anywhere! 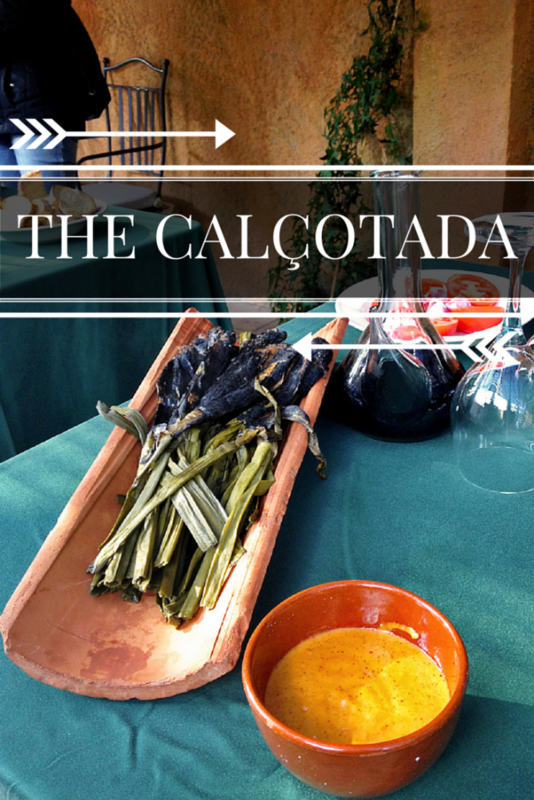 I’ve been to calçotadas at hotels, outdoor barbecue areas, wineries, and friends’ apartments. 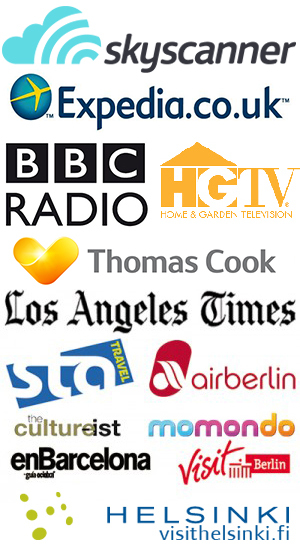 You could also go to a masia – that’s a rural house, usually in the middle of somewhere beautiful. That’s still on my calçotada to-do list! 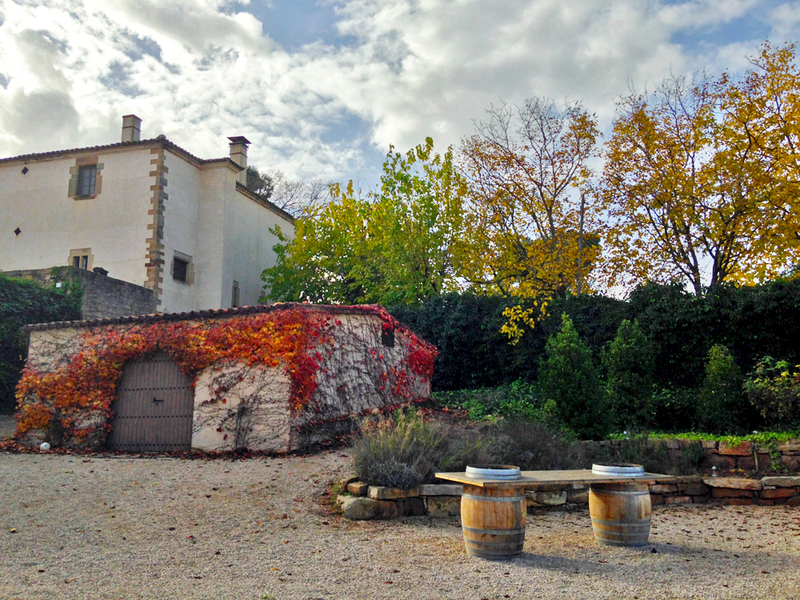 Just one of the beautiful places you can have a calçotada – a winery! 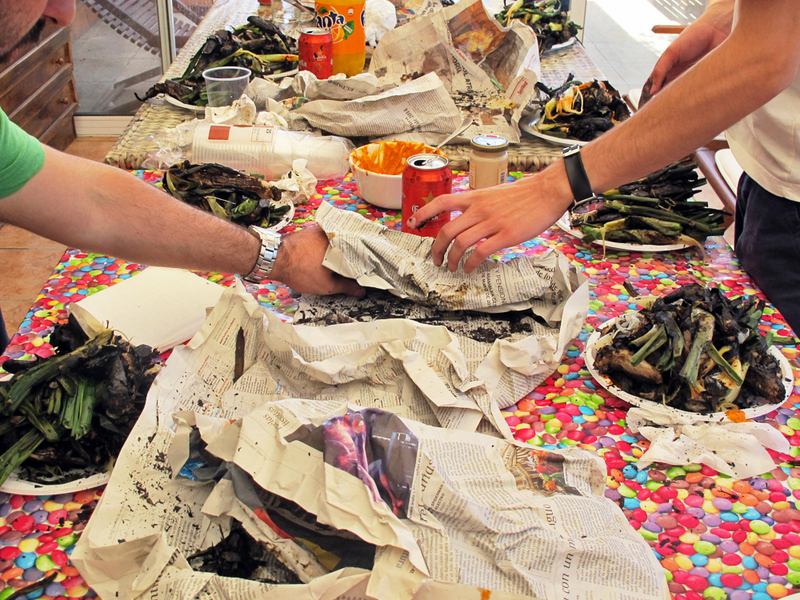 If you’re going to a calçotada, go hungry – there is lots of eating to be done! First, you’ll wait for your barbecue to eat up. In the meantime, have a little snack and chat with your friends. After all, calçotadas are both social and gastronomical events, so it’s good to round up as many friends and as much food as possible. 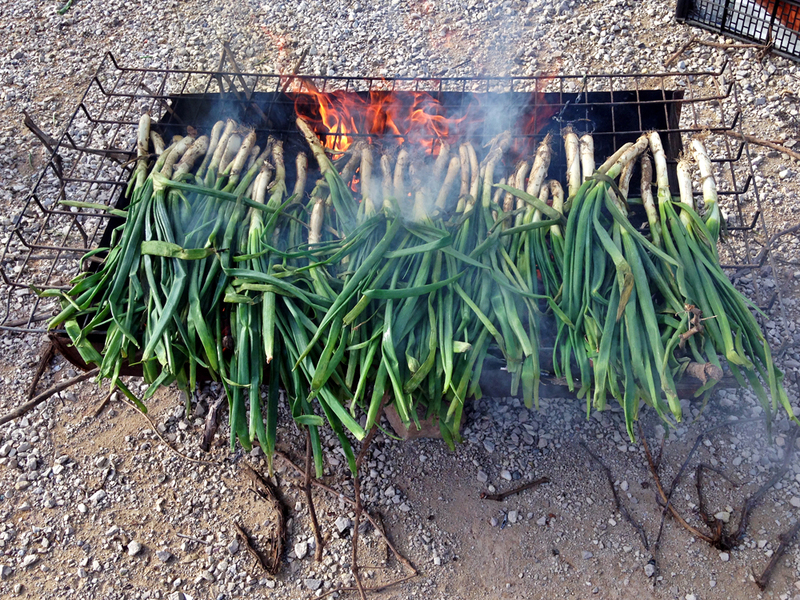 Speaking of the food..when the fire is hot, you’ll throw your calçot onions on the grill. Some people like to wrap them in newspaper to help them steam too. Have another little snack and chat while you wait for the calçots to slowly turn black. When they’re good and charred, you take them off the fire and place them on a terra-cotta tile to keep them warm. And at this point, I’m going to let you in on a little secret – you don’t actually eat the burned part….although some people love to play jokes on calçotada first-timers and pretend that you do. I’ve got friends who have politely choked back layers of the charred outsides and gasped “It’s delicious!” as they tried to subtly pick the ashy remains out of their mouths. Nope, what you do instead is gently pull off the outer burned layer to revel the sweet, tender inside. You’ll grasp the green end of the calçot to tug off the blackened layers – which is trickier with the smaller ones. Put aside the outer layers, and then dip the lovely inner part in romesco sauce. Of course, you’ll also want another accompaniment – wine, cava, or beer. 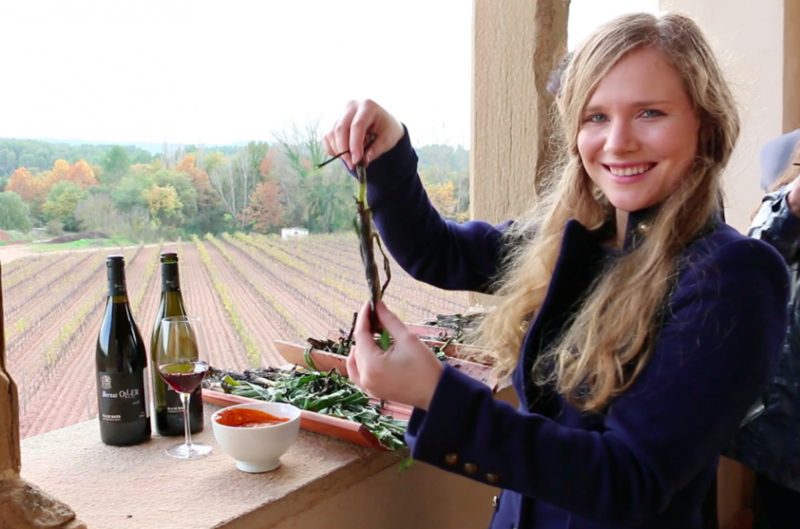 How to eat a calçot! Side note: your fingers will definitely get dirty during this process! It’s a sign of a good calçotada when everyone’s fingertips are distinctly dark grey. Some people prefer to eat their onions with gloves and bibs, but where’s the fun in that? Anyway, don’t sit back and relax, or you’ll miss out on the calçots. You might be surprised at how quickly they disappear. Every time I’ve gone to a calçotada, the onions have taken hours to cook and then are all swallowed in a span of about five minutes, leaving behind only piles of flaky burned pieces of calçots and blackened napkins. It’s a rather impressive feat! Don’t worry if you’re not full after your onions. You’re not done eating yet! While the first part of the calçotada is all about veggies, the second course is definitely not suitable for vegetarians. 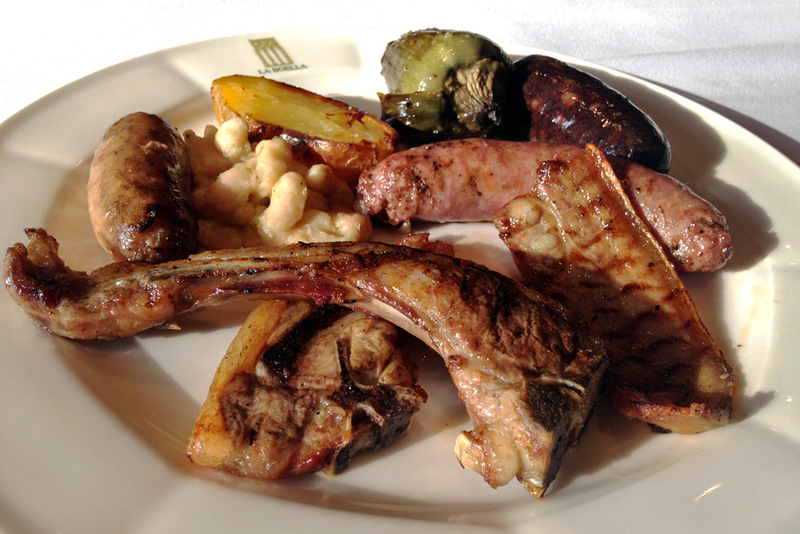 It’s a heaping platter of grilled meat, usually lamb and local sausages like butifarra. You wouldn’t want to let all that fire heat go to waste, would you? You can also toast bread on the fire, then dip it in the romesco sauce if you can’t get enough of the stuff like me. When I’ve had it at home, I’ve eaten spoonfuls of the stuff by itself. It’s so good! If you’re really feel brave, or really greedy, you can also go for dessert, which might involve oranges or something light after all that eating. My excuse this year was being unemployed – just look how much money I’m saving on food by eating a week’s worth in one sitting! Around sunset, you’ll probably start heading back home. Ideally, you’ll go home uncomfortably full and smelling of barbecue smoke, and with the lovely feeling of satisfaction that only comes from having shared a good meal in equally good company. Have you ever tried calçots? What’s the weirdest food tradition you’ve ever taken part in? 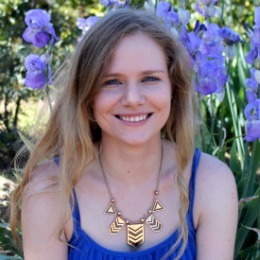 Fantastic article! In fact Calçotadas are not well known in other parts of Spain and it’s the best example of “social food” we do in Spain. With friend, open air in beautiful historic farmer houses… The best!! I’ve never tried calçots before, but a Valencian friend of mine did something similar with leeks at a barbecue we had here in Santiago last year, and they tasted really great! That sounds delicious! I can’t imagine they taste that different from calçots when they’re barbecued. I have ALWAYS wanted to do one of these, but haven’t gotten the chance yet! Looks fun (and YUMMY). It all looks so good, though without the second course of meats it would be a little much of one thing. I am sure I would have eaten like a mountain of burnt leaves before someone informed me of the proper way of doing things. Yeah, it can definitely be a lot of one thing, although that one thing is tasty! And yes, my first time at a calçotada I very nearly ate the burnt pieces haha. Thank goodness somebody explained it to me before I did it! Yes, they taste amazing when they’re cooked on the vine shoots! And the sauces are so, SO good. I could eat romesco and alioli all day long. A party based around seasonal produce = pretty darn cool. But a party centered around veggies dipped in romesco sauce = gaaaaah, where can I sign up?! It sounds quite tasty, if you get it right. I love that everyone gathers together to eat. It’s really delicious! And yeah, the best bit is actually gathering everyone together to enjoy the food. I’ve seen an episode of Anthony Bourdain’s show that featured this, but his take included copious amounts of alcohol. Lovely piece and details. Would love to partake! Wow looks so good! something you can share with family and friends!! Yup, definitely something to share! It’s nicer that way anyway. I definitely want to try a calcot! Love the article! Thanks Tiana! You should try calçots if you get a chance, they’re really tasty. I have never eaten calçots before. Now I want to, but only if I can be lucky enough to be invited to a calçotada. I have never tried calçots before and loved reading this article on how to make it, eat it, and I like how everyone comes together to have this meal! Yeah, that’s the best part – having everyone come together to celebrate! Prior to this article I had not even heard of Calçotadas! Now its something I want to try not just to taste but to apply what I’ve learned reading this article! They’re awesome! But I’d never heard of them before either, so they were a pleasant surprise.